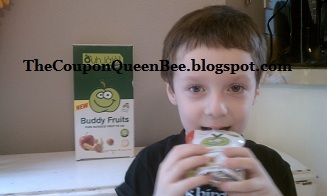 We recently reviewed a product called Buddy Fruits. They are an all natural, no sugar added 100% pure blended fruit to go. I am all about a healthy snack for my children so I loved the idea of fruit on the go in this handy little drinkable pouch. There are quiet a few different flavors to choose from like Apple & Banana, Apples and Cinnamon, Apple and Multifruit and Mango Passion and Banana. My 4 year old was my taste tester and he seemed to like most of the flavors. He really liked the Mango Passion and Banana as well as the Apple Banana. I think that anything with banana in it is a winner with him! It seemed that the apple flavors alone may have been a little overwhelming for him so I thought my husband and I should also give them a try. The more the merrier right? I liked the Apple Cinnamon and my husband agreed with my son on the Mango Passion Fruit. The top is a screw off style cap so you can twist it back on and save it for later if need be. This is virtually no clean up snack because the opening is small enough that even when you squeeze the pouch there is no overflowing mess, perfect for on the go and in the car. The packaging is so cute, they are very inviting to little eyes. The best thing about Buddy Fruits is that they do not have to be refrigerated, which is awesome cause fridge space seems to be limited around here. I love that we can take them on day trips and store them in the car for a "snack emergency". 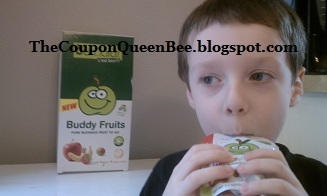 They are so handy and a great little healthy snack for my son as well as anyone who loves fruit. What a great idea! 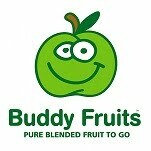 You can buy Buddy Fruits at Walgreens, Publix, Piggly Wiggly, Harris Teeter, and many more. You can find a retailer near you on the site under the Where To Buy tab. Or you can purchase them online at Amazon and Diapers.com. You can also win your own 18 pouch pack right here!! Enter any of the other giveaways during the Valentine's Day Event and leave a comment on which giveaway you entered. +2 for every giveaway you enter. *Limited to US residents; 18 years old and above. Giveaway starts January 26, 2011 and ends on February 6, 2011 at midnight PST. Winner will be emailed and has 48 hours to respond before another winner is selected. I was not paid for this giveaway or post. 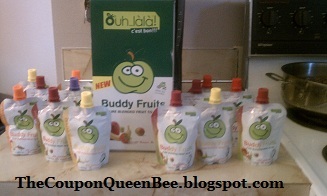 I was sent one set of 18 Buddy Fruit Pouches for this review. I read that one buddy fruit is equal to one fresh fruit. I liked buddy fruit on FB. Entered justpaperroses.com Valentine's Day Event +2 for every giveaway you enter. i entered Gortons seafood giveaway. I entered the stonyfield Yobaby giveaway. I entered bambino balls giveaway. I am now a fan of Buddy Fruits on FB. Just sent a friend request on FB. Entered the WB basket giveaway. Like Buddy Fruits on FB. Matt S.
I "Like" Buddy Fruits on Facebook. I like buddy fruits on FB.